This is such an exciting post for me today. For the first time ever, you’ll be able to get your hands on my very first collaborative design!!! EEEK! For the last few weeks, I’ve been busy behind the scenes, working with The Curious Department to bring you a limited edition PRINT that I absolutely adore. However, before I get to all that, I need to explain how this all came about. You may remember me speaking about my love of The Curious Department last month. 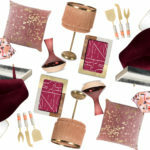 They create the most beautiful prints and accessories, inspired by the natural world and a love of glam Art Deco style. 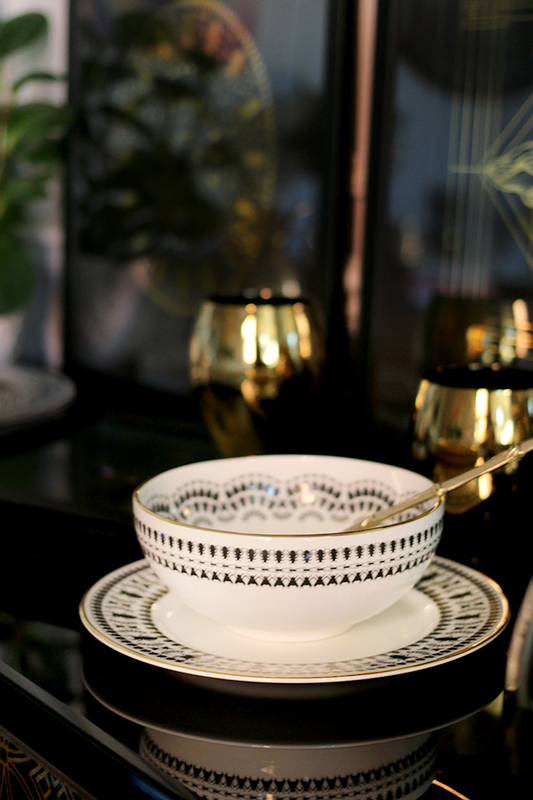 I stayed in their quirky Airbnb in London for a night and really got the sense that there was a certain synergy between our styles – eclectic and definitely glam, an unapologetic approach to style and a shared love of gold! I got the chance to meet Ross and Chris, the masterminds behind The Curious Department at an event that same week and we immediately clicked as well. It’s so nice sometimes to meet the makers behind businesses – it really reminds you that for every small independent retailer, you have some pretty passionate people with a love of great design working their arse off behind the scenes. And working their arse off they have. 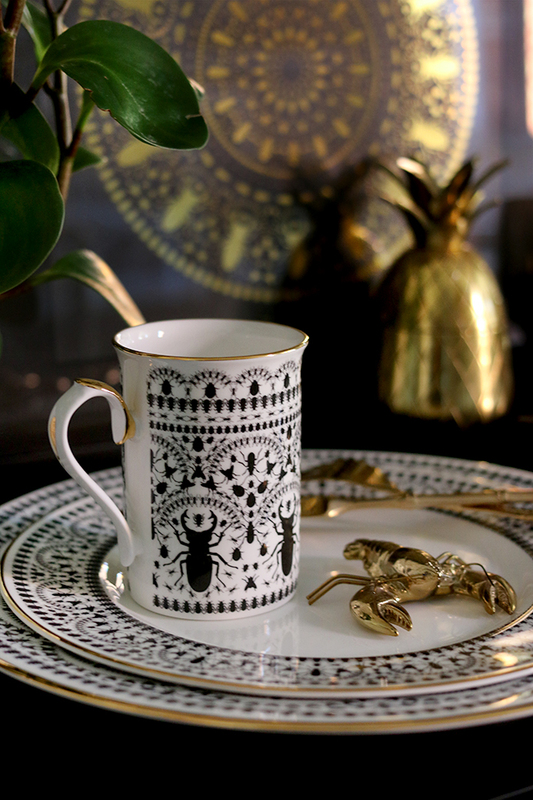 They have recently introduced the Insect Mandala Fine Bone China Collection to run alongside their first collection, Metamorphosis, designed, fired and hand-finished with REAL GOLD right here in the UK. I was able to get my hands on samples of these beautiful pieces to share them with you here today and they are truly gorgeous in the flesh! Here’s the catch. This stunning collection can’t go into production without your help. To overcome the financial hurdle of the upfront costs of production, they are using a Kickstarter campaign to facilitate pre-orders directly from the range, at either reduced retail price or with amazing limited edition rewards! If they reach their target, they’ll have enough funds to go into production, fulfil pledges/ pre-orders and get the products on shelves, physically and online. 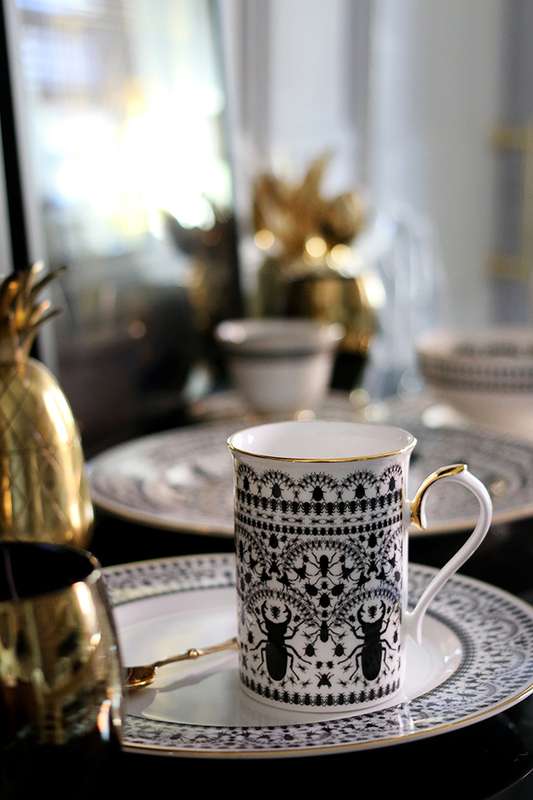 One of those rewards is a stunning black and gold butterfly print that I HELPED TO DESIGN. WHAT. Yes, seriously. And the best thing is, you can get your hands on one of these limited edition beauties for a pledge of just £20 or more. 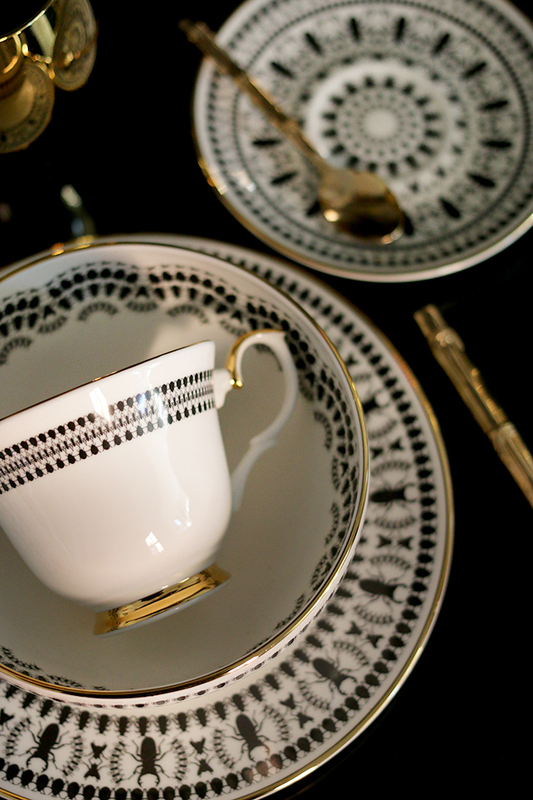 Of course, once you check out the rest of the collection, I think you’re going to love it and want to get your hands on a few pieces of china as well. 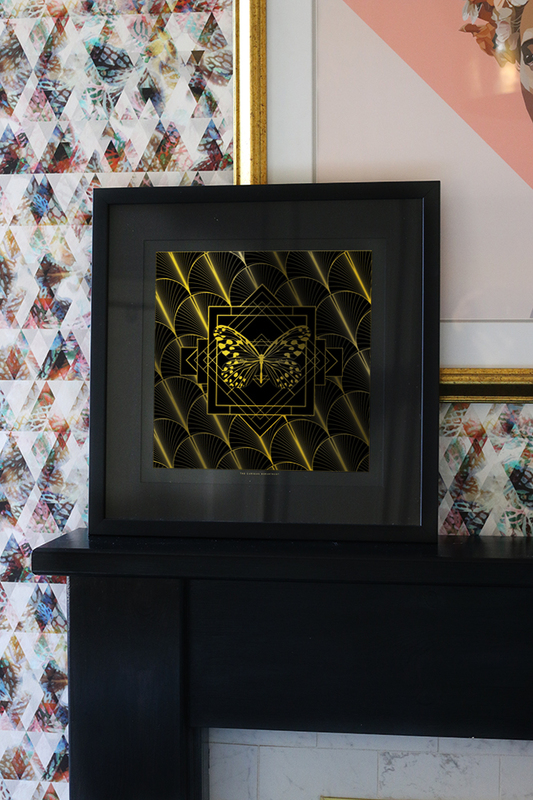 The Swoon Worthy Limited Edition Black and Gold Butterfly Print – ONLY available on Kickstarter! I had a chance to chat to Chris recently about the new Insect Mandala collection, the fabulous new limited edition print and the story behind what they do. Can you tell us a little bit about why you started The Curious Department? Well… it all started with a dusty old glass-and-brass cabinet buried underneath a mountain of junk in a salvage yard in Lewisham. Not very glamorous is it? But once the cabinet was rescued and cleaned up, it soon became Ross’ “cabinet of curiosities” in his flat, housing all of his unique finds and quirky homeware treasures, from marbled skulls to Faberge eggs to House Of Hackney essentials. The “cabinet of curiosities” idea grew and grew ever since, and Ross started plotting on creating his own items to compliment his decorative collection, and when we met we decided to give it a go together! As we’d both become new homeowners we also noticed a real lack of intriguing and interesting pieces out there to accessorise and decorate with- everything was either so soul-destroyingly bland, or priced way out of our league, now we were mortgaged up to our eyeballs. 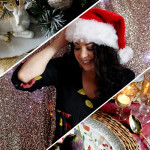 So we decided to create our own affordable art and homewares range… start small with some gold foil prints, and then moved into ethical taxidermy, home accessories and now most recently our China range. 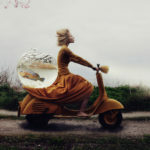 How did you come up with the concept of Metamorphosis? Is there a story behind it? There’s always a story! Well, we’ve both got a mutual love of nature, animals and insects, and have always been fascinated by the transformative process of butterflies. It’s actually pretty insane to think what those guys go through – total science fiction stuff! But we were also motivated by the fact that some people find bugs like butterflies “beautiful” and others like cockroaches and beetles as “gross” so we set ourselves a challenge of transforming them all into unexpected and universal objects of beauty! Then around the time we started thinking about creating The Curious Department we both were going through a few life changes (homes, jobs, the usual sh*t! ), so it just felt right that we started off with embracing the change and along came “Metamorphosis”. It just really clicked! Hahaha.. for the time being, sure! One of our first designs and signature pieces in the ‘Metamorphosis’ collection the ‘Insect Mandala’- the form and complexities of the creepy crawlies make for such a gorgeous and complex piece… really titillates our curious minds! But we love lots of other natural forms too… and we’ll be exploring that in future collections. We’re definitely more than just “the beetles and butterfly guys”! Absolutely! And for someone who tends to recoil when I see bugs, I actually adore these so that’s saying something. I think you achieved your mission of making them beautiful! I noticed as well, there are a lot of Art Deco influences in your designs – can you tell us a little bit about why this particular style appeals? 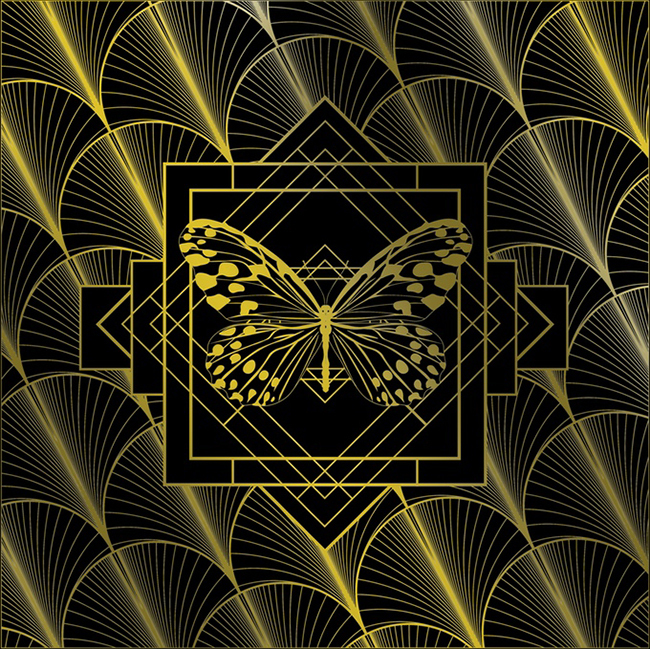 For us, Art Deco represents many things that ping our pleasure neurons; geometry, glamour & gold! It also has some more sentimental values too – Ross’s grandparents used to collect and restore vintage cars from the 1920’s along with antique furniture and home decor, so this design aesthetic seems very common place to him. As for me, growing up in New York, I was surrounded by Art Deco architecture which always seemed to stand out from the rest and still does . We have both always been fascinated with antiques and try to blur the boundaries between old and new, that’s why we dabble in taxidermy and such curiosities, old past times resurrected and served up in a fresh way. It’s important for us to always develop a tension and contrast in our work, whether it’s disgusting creepy crawlies re-arranged into a beautiful mesmerising pattern, or the hard geometric structures of Art Deco paired with the organic lines of nature. We aim to show you something you never knew you’d like. So the Kickstarter campaign is rather exciting. Why did you decide to use this platform for your latest collection? We’re just two guys, totally independently funded, trying to launch a new business in these post-Brexit and pre-Trump days. Pretty insane, right? We try to be realistic with our ambitions and scale, but we don’t want to quash our dreams either… so we figured the best way to validate our designs with the masses and not shoulder huge debts in upfront production costs, is to embark on a pre-order campaign, using Kickstarter. This way, we can use their huge platform to garner interest in the UK and worldwide, and see if there are enough like-minded quirky and curious individuals who’d appreciate our designs and willing to invite us into their homes! We’re hoping to get enough pre-orders to create our first initial run and get us on the radars of a few retailers. With any luck (and tenacity!) we hope to be in production by end of Jan, and shipping soon after. We’ve already got a few prototypes of further items we can add to the collection too, (teapot, anyone?) so this is just the start! What kind of rewards are in store for backers of the campaign? We’ve been extensively teasing our china range since we launched in August and to say thanks to everyone who’s been following us we wanted to do some exclusive rewards, particularly around new items we’re thinking of adding to our store. So not just added value but also a thank you to our early adopters! Alongside some fantastic cost-saving bundles, we’ve paired up some with exclusive limited prints, cushions and even offering a one-of-a-kind hand painted beetle by co-founder Ross! But our most exciting reward is our collaboration with you! Yay!! I just gotta ask, why did you decide to work with ME (of all people!) for your special edition print? Just felt like such an obvious fit! 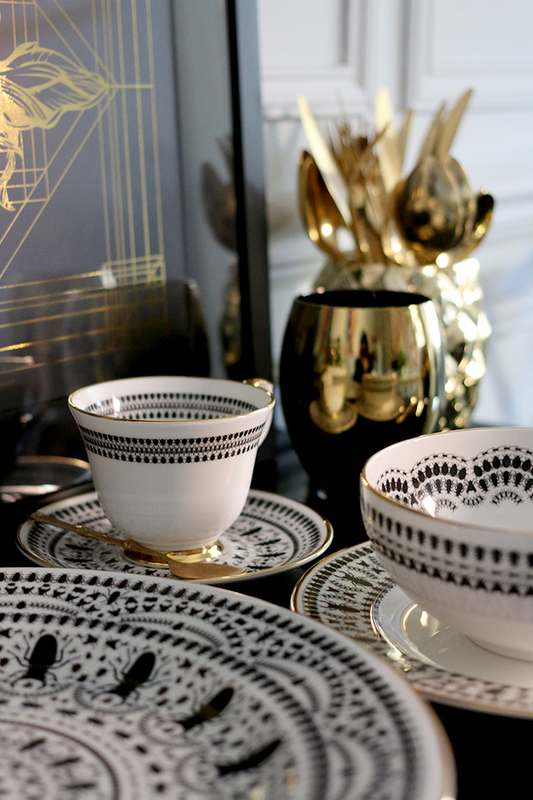 When I first came across Swoon Worthy (via last years’ Amara Awards) I was in awe of the eclectic tastes on show, the appreciation of gold and shiny things, the bravery of pattern clashes, and the juxtaposition of trend following and trend ignoring! Immediately got the feeling Swoon Worthy was a place where creativity was championed without any stuffiness or airs, and definitely with a curious mind at the helm! Having shared a cocktail or two and a few lols with you in the flesh, I was really keen to work closer, and felt that an exclusive collaboration would add a unique spin on our ceramics launch, and be a great opportunity to learn and evolve, as well have a bit of fun along the way! Awww gosh. Yeah, it’s definitely been fun! So tell us, what’s next for The Curious Department? One thing we don’t do is rest! 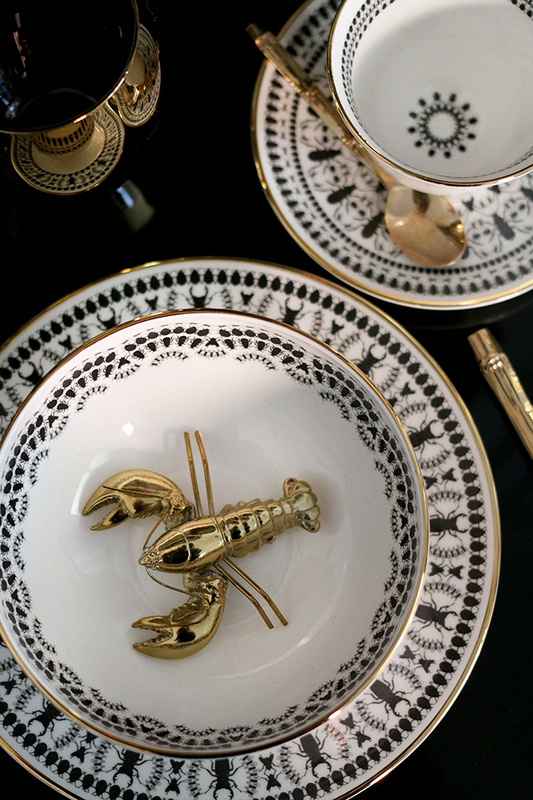 So, besides the Kickstarter campaign for our fine bone china range, we’re currently finalising plans to add placemats alongside our popular gold insect coasters. We’re also working on ways to extend the Metamorphosis range around other products, like soft furnishings including cushions and throws. And when we have a spare minute we pick up our pens and continue doodling designs for our next collection, which will have a sealife theme! So, are you ready to get your hands on my limited edition print as well as a few pieces of this delicious collection? Check out The Curious Department Kickstarter campaign here and pledge whatever you can. This is definitely a collection I love and just know that you will as well. Plus, it’s a chance to support a small independent business which is something we should all strive to do. Let’s help Chris and Russ get this into production and reap the rewards of their hard work and creativity! This is amazing! Congrats! Can ppl in the us participate? These are so beautiful! What a unique look as well. 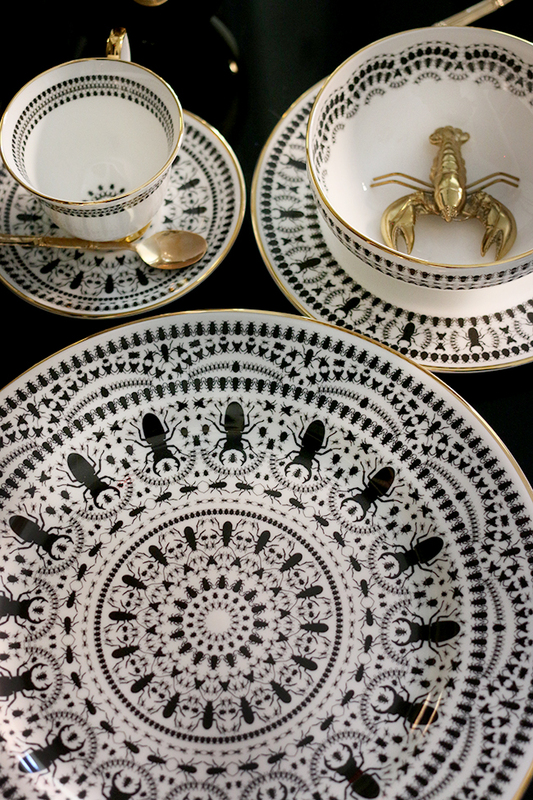 Love the stag beetles on the plates. The touches of gold really lift the design. Your artwork is fab too – you are a clever lady. Wow. This couldn’t be a better fit if it tried (although I didn’t see any leopard print just yet). Their china is amazingly beautiful. I ADORE bugs. Timorous Beasties is another brand that just gets it right, making the seemingly creepy appear glamorous and sophisticated without it appearing gimmicky. I shall go take a look at The Curious Department’s stuff right now. Really like it. 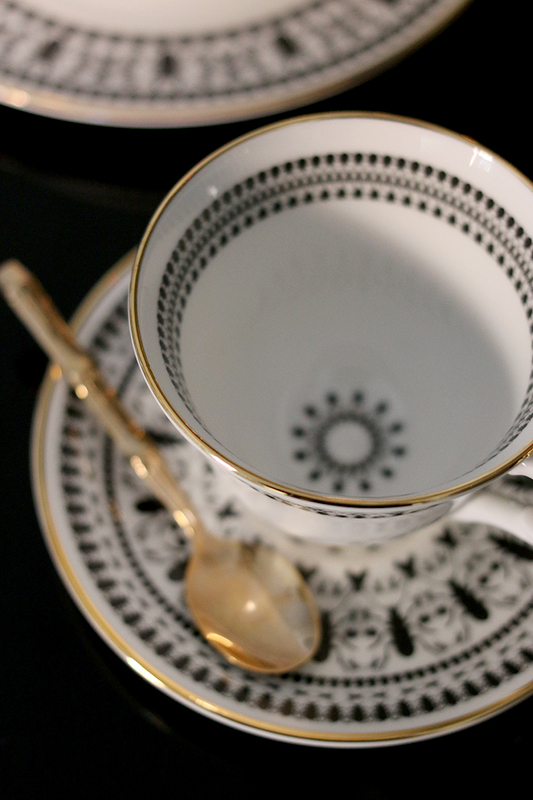 Fan-freaking-tastic china pattern! 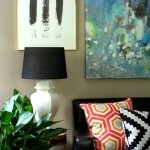 What a beautiful design and it definitely is such a chic way of incorporating an eclectic glam style! Love it. I love the design of the china, hope they do well on Kickstarter. Fab to have your very own print design available too!